IDOT believes in partnering with Illinois communities statewide to promote a safer, sustainable and effective transportation system for Illinoisans. Through effective partnerships and collaborations, we demonstrate our commitment to move the transportation vision, Transforming Transportation for Tomorrow forward. Partnerships like this encourages and educates citizens of Illinois to create a positive impact in their community. Our goal is to spread the word and remind people not to litter in Illinois. We need your help! The Illinois Adopt-A-Highway program brings citizen volunteers into partnerships with IDOT to pick up trash and keep our roadsides clean. The program also educates and encourages people to stop littering. Through the cleanup efforts of more than 10,000 Adopt-A-Highway volunteers throughout Illinois, visitors and tourists have a better first impression of our state and roadways are safer because of less roadside debris. Illinois needs your help to keep its roadsides clean. Please consider adding your group of friends, neighbors, coworkers, or club members to our list of volunteers who make a positive impact on the area where they live. To participate, each volunteer group applies for a two-mile section of highway, which they select from an interactive map within the application. Once approved, volunteer groups agree to remove litter from the assigned section of highway at least four times each year for a two-year period and agree to complete an Adopt-A-Highway Clean-Up Report after each clean-up day. In return, IDOT will install roadside signs identifying the volunteer group as an Illinois Adopt-A-Highway participant. 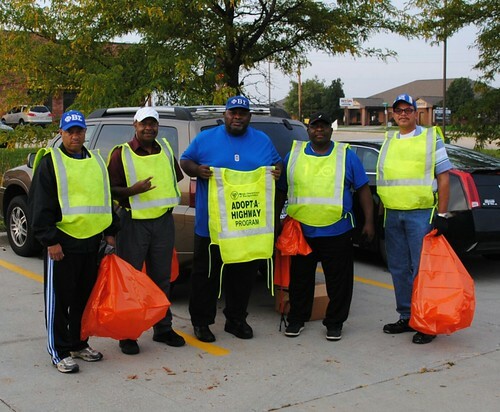 IDOT provides safety vests and trash bags to Adopt-A-Highway volunteers and removes the bags from the roadside. There may be times when a road may appear available for adoption but, for a variety of reasons, is not available. Reasons may include that the roadside is considered unsafe for volunteers or the state route is in an area where the municipality has its own Adopt-A-Highway program. If you choose an unavailable location, an IDOT representative will contact you to discuss alternative options. To apply, please complete the interactive Adopt-A-Highway Request below. If you prefer to print a copy of the form, select the Adopt-A-Highway Permit Request (PDF). Questions? Please email DOT.AAH@illinois.gov or call (217) 557-3224. Watch an instructional video that includes some important safety tips. Download a copy of the program rules. If your group completed a clean-up of your adopted highway, please complete an Adopt-A-Highway Clean-up Report. If your group no long wishes to participate in the Adopt-A-Highway Program, please let us know why so we can continue to improve our program. Over the past 25 years, the United States has made tremendous advances to clean up our nation's waterways by controlling pollution from industrial and sewage treatment plants. However, little has been done to address the effects of stormwater runoff pollution. Stormwater runoff pollution is a leading cause of water quality problems. Nonpoint Source Pollution (NPS) is the primary reason many of our waters are still considered unfit for swimming and fishing. NPS pollution is caused by the everyday impacts of individuals interacting with the land. Each of us can contribute to this problem without even realizing it. Stormwater runoff pollution, unlike pollution from industry and sewage treatment plants, can come from a number of sources. This type of pollution is caused by rainfall and snowmelt moving across and through the ground picking up pollutants along the way and depositing them into lakes, rivers, wetlands, and our underground source of drinking water. Fortunately there are many ways in which we can all help to lower the amount of pollutants reaching our waterways and ground water. "Things You Can Do To Reduce Stormwater Runoff Pollution"
Don't litter. Litter adversely affects water, plants, and animals. Do not dump pollutants down a storm drain. Motor oil, grease, gas, paint, paint thinner, and other household chemicals are all pollutants. These chemicals can be devastating to fish and wildlife in and around our waterways. Dispose of hazardous household chemicals properly. Many communities have hazardous waste collection centers. Take your car to the car wash instead of washing it in the driveway. Cleaning chemicals are pollutants and the car wash has the means of properly disposing of the waste water. Properly clean up and dispose of vehicle fluids and household chemicals. This especially includes any spillage or leakage that may have occurred. Participate in community hazardous waste disposal days. Many communities have several days out of the year when citizens can bring hazardous waste to have them disposed of properly. These include, but are not limited to, paint, oil, and household chemicals. Use fertilizers and herbicides sparingly. A light rainfall can cause these chemicals to runoff your lawn or garden into a storm sewer system. Have your septic tank pumped and inspected regularly. Faulty systems can leak contaminants into surface water. Pick up after your pets. Pet waste contains nutrients and pathogens that can contaminate surface water. Recycle electronics and appliances. Items, such as computers and refrigerators can contain pollutants, including lead and freon. Direct gutter downspouts away from driveways and bare soil areas. This will prevent debris and sediment from washing into storm sewers. Help prevent erosion. Re-vegetate or mulch any exposed soil as soon as possible. Participate in community clean up days. Help educate people in your community. Get your community groups involved. Any Illinois community or local organization may submit a nomination for national designation of a specific section of roadway, but the nomination must meet stringent criteria and be submitted through IDOT. Information regarding nominations, grants, and federal contact information may be found at the Federal Highway Administration’s Scenic Byways webpage. The National Scenic Byways Program and the Illinois Scenic Byways Program include only one restriction. The federal law which created the program prohibits new off-site advertising along nationally designed roadways. Please visit our Scenic Byways webpage for more information. View our success stories on the SRTS website! Do you have a success story about how Safe Routes to School has impacted your school or community? We are always looking for stories to share and to inspire the Safe Routes community. If you have a Safe Routes success story to share, please send us the information at DOT.SafeRoutes@illinois.gov. Thank you for your interest in encouraging safe walking and biking to school. Here are some things you can do today! For more information on the Illinois Safe Routes to School program eligibility, guidelines and program information, please visit the Safe Routes to School webpage. Help us Drive Fatalities to Zero! IDOT has a zero fatality goal and we need your help!